Gas fireplaces, like woodburning fireplaces, have a season. Usually, turning on a gas fireplace is as simple as flipping a switch. 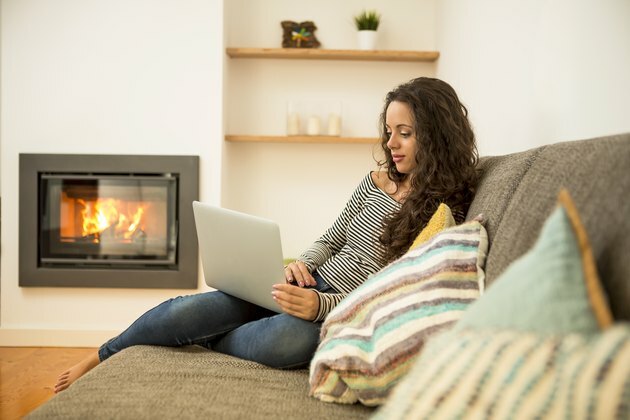 But if it's the beginning of the cold season or you haven't used your gas fireplace in two months or more, you'll want to bleed the lines before starting the fireplace. While your fireplace is not being used, air holes can occur in the lines. Bleeding pilot gas lines is important, but it is not difficult. Just make sure you follow the directions. Make sure you're in a well-ventilated room, and make sure there are no open flames anywhere nearby. Locate the shut-off valve assembly of the gas line to your fireplace. Open the valve assembly by turning it parallel to the gas line. Then, locate the pilot assembly, either in the bottom of the fireplace box or in back of the logs. Find the igniter switch. It is usually red or black. Then, push the igniter button. There should be a blue spark where the pilot assembly is located. A pilot light is either standing or electronically ignited, but it must light and remain lit to generate heat. You'll need to make sure there's no air in the gas line to keep the pilot light lit. A standing pilot light is sparked by turning on the gas and introducing the flame. Electronic ignition makes use of a spark to light the gas. You'll want to locate the gas valve control knob. Push it in, hold and rotate counterclockwise until you see the word "Pilot" or "Ignition" in the "On" position. When held in this position, it should press inward a quarter of an inch. While pressing the valve control knob in, press the igniter button repeatedly until the pilot ignites. This could take anywhere from one to 10 minutes to bleed air out of the lines as the gas starts to flow. Once the pilot is lit, continue to press the valve knob inward for 30 seconds before releasing it. Now that the pilot light is ignited, turn the valve to the "On" position. If the pilot light goes out, start the procedure over again. When the pilot light stays lit, your fireplace should continue to switch on and off easily and safely as long as you use it regularly. If gas is coming out of the pilot but it won't light, the spark igniter could be the problem. You'll need to clear out any debris or air between the igniter and the safety pilot system. This includes a thermocouple – a metal probe that controls the gas valve – that senses the temperature and generates electricity to ignite the gas, if necessary, and the combination valve. If the pilot lights but does not stay lit, try blowing compressed air into the pilot area. The fuel to air mixture in your fireplace must be correct for it to work properly. The air vents must be kept clean and free of debris. Once this is taken care of, you should be able to enjoy your gas fireplace for the season. Using natural gas, whether from a gas line or propane source, does have risks. These are minimized as long as you follow instructions. The first thing to do is keep all your user manuals for any item in your house that uses gas. If your fireplace is flooded, it's best to call in a heating or gas contractor to make sure the gas line is safe to use. If you smell gas, that means there's a leak. Natural gas is odorless, but mercaptan is added to gas. It gives gas a strong, unpleasant smell, much like rotten eggs. If you smell gas, gather all occupants including pets and leave the house immediately. Leave windows open if they are open, but do not stop to open windows. Call your energy provider immediately, or emergency services if you do not know the source of your gas. Also, if your gas source is from a propane tank, have your propane company check it before you begin using it, especially if it has been off for over two months. Set up a regular delivery schedule with your propane provider to ensure your tank and delivery system is working properly. Regularly check the vent on your fireplace to make sure it doesn't become clogged. Also, install a carbon monoxide detector in your house to make sure carbon monoxide buildup is not occurring.